‘ Textile Alchemy’ is the title of the latest exhibition by the Turning Point Textile group at the Stirling Smith. Turning Point is a group of seven textile artists from the central belt of Scotland who work separately but hang well together. There are six themes in the exhibition, and Joyce Watson’s ‘Puddles to Power’ piece with the pylon, is in the environment section. ‘Water fills the dams, feeding our hydro-electric power which is then transmitted by majestic pylons’. 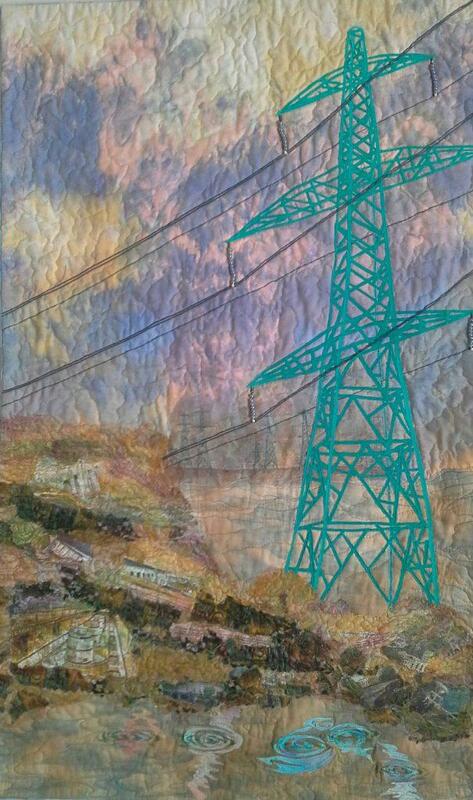 After the protests over the Beauly to Denny Power line with its 615 giant pylons, pylon majesty is not the kind of theme that might have been expected in a gallery setting. The alchemy of the exhibition is in how textile materials are transformed into beautiful works of art. One hanging by Christine Livingstone, depicting the artist’s garden with flowers was made with materials from a charity shop. ‘Trees and Leaves’ by Margaret Morrow has leaf shapes stitched to a layer of sheer fabric and the background burned using a soldering iron. The effect is that of an autumn day with leaves floating in the breeze. At present, textile art is neither highly prized or priced, but these are the heirlooms of the future and most are available to buy now.